Previzion’s internal data capture and rendering engine can be synchronized to external, data driven signals, or an internal timer when no external sync data signal is available. The external encoder box and the Airtrack both generate serial data streams when triggered by a tri-level sync genlock signal applied to their genlock input. When first started up, Previzion defaults to the Timer sync, but will store the selected sync sources when shut down, and automatically reconnect to them when started up again. The frame delay sets the delay of the tracking data to synchronize with the video. Digitizing the video frames always takes longer than bringing in the tracking data, so the delay lets you adjust this to make the images synchronize with the tracking motion. Turn off Motion Blur in Scene Tab by setting the Motion Blur Scale to 0.00. This will make it easier to view the delay difference. Have the camera operator pan back and forth in short hops while looking at the foreground/background registration and adjusting the time delay by 1/2 a frame at a time. There should be a point where FG and BG move closely in sync. 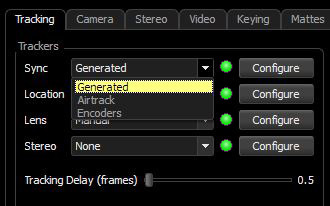 As of build 7818 (publicly released in build 7964), Previzion has a separate slider for Lens Delay. Because some lens controllers can be faster or slower than the physical tracking data delay, you will need to adjust this as well. The difference between Tracking Delay and Lens Delay should be around 0.5 frames or so. Quickly zoom in and out with the lens controller until the virtual and real elements move together. For prime lenses you may do the same with the focus adjustments, but, setting the Lens delay to match Tracking Delay, may be easier. Prime lenses are harder to tell delay differences. When the Airtrack or encoder box is connected to Previzion over RS232 and connected to a genlock signal, the green light to the right of the drop down box will light up to show a sync connection. Select Airtrack from the Sync menu, and verify that the green light goes on. If not, check the power and serial data connections for the Airtrack.